In Russia, history remains a state secret. Any Russian publication is so well sanitized that Orwell imagination would badly pale against the achievements of the historical production lines. A scholar trying a look back would find a dearth of published references, even when the facts are imbedded in the body of the Rus annals. Over the centuries, only few people, starting with V.N. Tatischev and V.V.Latyshev, ventured to reflect a true picture. The posted extracts from the “History of Tatar People“ present a work that was written to remain in the desk drawer until better times, but saw a light of day when the Soviet system collapsed for a short time. 1. Dagestanithe Bulgars: time and circumstances of the resettlement in the Itil basin. 2. Formation and the early history of the Bulgarian princedom. Reminder. By the 8-th c. Bulgars and closely related peoples were divided into four large groups. First group is Danube Bolgars. Princedoms Altynoba and Duloba, empire Great Bulgaria, kingdom Kara Bulgar. Third group are Dagestani Bulgars or Burdjans. Their state developed into a form of a princedom. Fourth group are closely related to Bulgars Utigs, who, from the 1st c. AD, lived in the regions of the Middle Itil basin. Their state developed into a form of a princedom. At first, the Bulyar princedom was in vassalage to Great Bulgaria, and later to the Kara Bulgar kingdom. If previously in the center of our attention were Kara Bulgars, now we shall look at the Dagestani Bulgars. Burdjans, i.e. the Dagestani Bulgars, were the descendents of those Bulgars, who in the 50's - 60's of the 4-th c. remained in the Dagestan region, and did not leave with the Huns. They consisted of three large groups: Barsils, Savirs and Baryndjars. 1.1. Barsils. In ancient times, the Armenian authors called them Barsils, the Byzantine called them Baslas and Barsils, the Arabian, Bersuls. In the Old Turkic language the word “Bars” originally meant “tiger”, then “greyhound”, and later settled for the present bars. The word “Barsil” consists of two parts: “bars” and “el” (or “il”) and means “bars people”. Bars was a totem animal for Barsils. The relation of Barsils to Bulgars. The Barsils were the descendents of those Sumers - warriors, i.e. Bulgars, who were settled by the king of Masguts (Massagets) in the Northern Dagestan area. Hence, Barsils belonged to the authentic Bulgarian tribes. The territory, occupied by Barsils, in ancient times was called Bersilia. In the 6-th - 7-th cc. AD Barsils lived in the territory from the lower reaches of the rivers Sulak and Terek to Itil. It was a blessed area: thick wetland meadows, pastures, and fertile lands. River watersheds, abundantly overgrown with cane and reeds, were rich in fish. The Barsils were hard working. They tilled the land with mattocks, grew millet and wheat. A part of Barsils led a semi-nomadic way of life. In the summer Barsils - herdsmen grazed horses, cows and sheep in the plain part of Northern Dagestan steppes, and in the winter they lived in semi-fortified villages. From the deep ancient times Barsils knew how to build cities. The largest and best-known city was Bulker-Balkar. In the cities grew crafts: ceramics, weaving, metal working etc. Barsils had a governor with a title “Mikhtar”. Mikhtar is a title of the Barsil’s hereditary Prince. The Arabs decisively affected the historical fate of Barsils. They attacked Barsils in 706. The war lasted thirty years (706, 721-723, 726-729, 731-733, 735-736 AD) In 736 Barsils suffered a final defeat. The Arabs carried off 20 thousand captured Barsil fighters. The Barsils who remaining alive left to the lower Itil and occupied there a large island. The island became black with the cattle and people gathered there: neither trees, nor grass remained there. Then this island received a name “Black”. 1.2. Savirs. In different languages and various written sources the name of this people is given in diverse forms: Saspirs-Sapirs-Sabirs-Sepers-Savars-Savirs-Savans-Suvars. Why such a diversity and wide range in the description of the ethnonym of these people? First, in the sources the name of the people is given by ethnically different authors, in particular by Greeks, Latin and Arabs, and accordingly the variations of the ethnonym are recorded in Greek, Latin and Arabic transcription. In many cases, the variations in the transfer of an ethnonym from the language of the people to different languages are explained by the specifics of the phonetics of this or that language, by the phonetic position of this or that sound, by the specifics of the graphic transfer of Old Turkic words and ethnonyms to other languages. Even the letters with the identical graphics in the Greek, Latin and Old Turkic alphabet have different sounds. Secondly, the discrepancies are possible simply by misspelling, by errors in the graphic transfer of the sounds of the Old Turkic language. Thirdly, it is necessary to consider a time factor: with time, many ethnic names changed, in some cases quite dramatically. In this case it should be emphasized that with all the changes in the ethnonym “Savirs” (“Suvars”), its basic components did not essentially change. Question. What information the works of the antique authors contain about Savir people genesis and the places of their initial habitation? In search for the answer to this question let us first of all look to the work of the “father of the historical science” Herodotus. The most ancient reference to Savirs in the form “Saspirs” is in the “History” of Herodotus (born circa 484, died circa 425 BC). He wrote: “The distance from the Palus Maeotis to the river Phasis and the Colchians is thirty days' journey for a lightly-equipped traveler. From Colchis to cross into Media does not take long, there is only a single intervening nation, the Saspirians, passing whom you find yourself in Media” [1.104] (2; Book 1, 45). Required explanations. Lake Maeotis is the modern Azov Sea; Phasis is the modern river Rion (aka Rioni, 42.1°N, 41.6°E), and Media is the western part of the Iranian plateau. Location of Saspirs: “Saspirs lived in a valley of the modern river Chorokh, which runs into the Black Sea at Batumi” (41.6°N 41.6°E) (2; comment 517). There are questions: whether Saspirs were the original inhabitants of the modern river Chorokh valley in the vicinity of Batumi, or they were newcomers from other places? What was their ethnic affiliation? Information in the historical sources allows to give the following answers to these questions. The past literature on this question has a point of view, according to which the Saspirs of Herodotus are related to Ibero-Georgian peoples. This was stated by I.M.Dyakonov (3; 338, 339, 355). This view is repeated in the “History of the USSR” (4; 205). However, it is not justified by anything and in any way. To discern somehow the ethnic affiliation of the Herodotus’ Saspirs requires to submerge deep into the centuries. The Savan nation is subdivided into two groups, the first group is called “Vyryg” and follows their king (i.e., a Vyrygian leader, not a Bulgarian king), and the second group Askel with their king. Among the Bulgarian peoples of the Middle Itil basin in 922 existed a nation (Savan) consisting of two large kins, namely: Vyryg and Askel (Esegel). “Phrygians are none other than Vrigs, a Thrachian tribe” (8; 87) . From the Phrygian coast of the river Galik (the modern Kyzyl Irmak or Kyzyl Yrmak, 41.5°N 36°E), Brigs-Sapeans were pushed, apparently, by Medes. They re-established in the valley of the modern river Chorokh, flowing into the Black Sea at Batumi (9; comment 517) (Phrygian king Midas was buried near Gordion under a magnificent kurgan of a Timber Grave type). In 20's of the 6-th c. BC Brigs-Sapeans became dependents of Persians, paying an annual tribute of 200 talants (at 26 kg/talant, this is 5,200 kg of gold? silver?). In the 5-th c. BC Herodotus noted them under a general name Sopirs. In the 3-rd c. BC Apollonius Rhodius mentioned the place of their residence approximately in the same region as Herodotus, i.e. in the valley of the river Chorokh, flowing into the Black Sea at Batumi. However, he gave the name of the people already in a form “Saspirs” (10; comment 413). In the 2-nd c. AD Ptolemaus Claudius gives the name of these people in the form “ Smors”. Savars already lived in the region of the modern river Kuma. Their possessions in the east extended to the Lower Itil. From time to time they pastured to the Ural mountains (11; 413). Then Savars pastured in the steppe and forest steppe zone of the Western Siberia. There they engaged in pastoral cattle breeding, grazing from Altai to the eastern slopes of Ural mountains. Savars intermixed with Ugrians and became known under a name Sepers. Apparently, the life of Sepers went by in an invariable order. However, the monotony of their existence was suddenly interrupted. The ethnohistory of Sepers not only accelerated its pace, but it also made an abrupt turn. Came the epoch of the Great Movement of the Peoples (4 - 7 cc. AD). Some unknown force snapped peoples from settled places and forced to move. Some of them dashed the steppes from the east to the west like swift mountain rivers, the others rolled over the steppes, the third were blown as fallen autumn leaves. This whirl picked up Sepers also. Under a pressure of Avars (Slavic “Obrs“) a part of them left Western Siberia and streamed west. Driven by a fate, life events, and more powerful peoples, Sepers reached the eastern coast of the Black Sea. In all probability, they wanted to break through to the home of their ancestors, Saspirs. However, Sepers managed to reach only the basin of the river Phasid (modern river Rion). They did not reach the banks of the river Chorokh: by then, the Black Sea coast was already occupied by stronger peoples. About 461 - 465 AD, Sapirs or Sabirs attacked Saragurs (lit. “Sary Tribes“, “Yellow“ in the lexicon of historians), Urogs, and Onogurs (lit. “Sary Tribes“, “Yellow“ in the lexicon of historians), Урогов и Оногуров (lit. “Ten Tribes“, aka “Onogundurs“, a tribal union; possibly, this is a distortion of Hunogurs/Hunogundurs), who lived at that time in the Crimean peninsula. However, they could not hold on to the Crimean peninsula. In the end of the 5-th - beginning of the 6-th cc., they already lived in the region of Northern Dagestan, opposite the Caspian gate (historical names: Djora, Derbent Pass, Temir-Kaput, Chora). In the beginning of the 6-th c. they were called Savirs. The historians Theophanes, Jordanes, Procopius related Savirs to the Hunnish peoples. By this time, Savirs became numerous and powerful people. Savirs frequently attacked the Byzantine Near Eastern provinces through the Derbent Pass, they actively participated in the Byzantine - Persian wars, at times on the side of the Byzantine emperors, sometimes on the side of the Sassanian governors of Iran. Their warriors were well armed. They were especially skilful with swords. Storming the cities, Savirs used wall breaching machines of their own design, better than the Byzantine machines. Savir fighters - men trimmed their hair in front, and on the back plaited it into braids. Savirs established a state in the territory between the lower course of river Sulak and the city Derbent, a princedom Suvar (or Djidan). Its capital was Varachan (i.e. Belenjer/Belendjer, “army head[quarter]). It was on a hill 15 km from the coast of the Caspian Sea. The Savir people were comprised of several large clans, lead by princes. In addition to the princes of separate clans, there was a common prince for all Savirs. He had a title “Elteber” (“El” is people, “Teber” is distorted from “Mtavar” - Prince), i.e., “Prince Of All People”. The Savirs were Tengrians. In other words, like all Hunnish peoples, Savirs worshipped a Supreme deity Tengre. Savirs became Tengrians in the Western Siberia, where their ancestors intermixed not only with Ugrians, but also with the Huns. In the regions of the Northern Caucasus, Savirs also began to worship trees (trees as a symbol of the Creation, a World Tree, is an essential part of the Tengriism, irrespective of the Northern Caucasus or any other location). Savir’s sacred tree was oak. They especially revered a majestic ancient oak in the vicinity of Varachan (i.e. Belenjer). Annually, in the first full moon in June, a sacrificial horse was brought under this oak. With its blood Savirs sprinkled the ground around the sacred oak. The head and the skin of the horse were hung up on the branches of the tree. Savirs deified not only the Sky - Tengre, the oak, but also the sun, the moon, a thunder, fire and water (sorry, this is nonsense. For Deities and Hosts, see Tengrianism). In the Savir funeral rites is also observed a unique combination of Hunnic customs with the traditions of the Caucasus peoples. When a man died, his body was laid on the ground in the backyard. Close relatives of the diseased imitated a sword competition. With bared swords, they initiated fights with each other, slashing the corpse from time to time. Savirs believed that a malicious spirit possessed the body of their relative and needed to be expelled, in order not to harm the diseased in the afterworld. At this time, women started a “wild wailing” over the body of the diseased. In 682 Elteber Alp-Ilitver adopted, together with his attendants and close relatives, a Christian faith. With that, Elteber demonstratively cut down the sacred oak near Varachan (i.e. Belenjer). From its wood with his own hands he built a huge cross. On Elteber’s commands, the sanctuaries and idols were destroyed, and the clergy executed (in a most Christian manner). With such repressive measures, Alp-Ilitver wanted to force his kinfolk to accept Christianity. However, a majority of Savirs kept fidelity to Tengrianism. As a result of a rebellious plot, Alp-Ilitver was killed. 24 years after these events, a terrible trouble fell on Savirs. A war with the Arabs has started, and it had a decisive influence on the historical destiny of the Savirs. In 706, the Arab troops passed through Derbent Pass and attacked Savirs. In 731 Savirs, together with the Khazars, organized a large retaliatory strike. They broke through to Transcaucasia , crushed the Arab garrison, stationed in the Caucasian Albania (modern Azerbaijan), and forced the Albanians to pay tribute. However, the Caliph soon sent a new army, which defeated Savirs and Khazars. In 736 the Arabs began a decisive attack and completely defeated Savirs. Those who survived retreated to the Lower Itil. Another part of Savirs left to the west and resettled between Donets and Dnieper. Their descendents until the 17-th c. were discriminating themselves from the Ruses and Russians, i.e. they kept their tribal name Savirs (Slavic “Seveyans“) (12; 130). A historical fate of the Savirs who moved to the Middle Itil basin will be reviewed a little later, thus far follows the synopsis. 1. Most ancient historical ancestors of Savirs are Phrygs and Sapeans. Phrygs are the descendents of Imens of the Little Rum (Balkan peninsula). Sapeans are one of the Cimmerian clans (Sokhots or Khots). They met in Thrace, i.e. a southeastern part of the Balkan Peninsula. 2. The initial form of the name for the people who arose as a result of the intermixture of Phrygs and Sapeans was Saspirs. 3. The subsequent Greek, Latinized, and Arabized forms of the initial ethnonym: Sapirs-Sabirs-Savars-Svans-Savirs (Svans, who live in Svanetia, 43.1°N, 41.7°E, are rated as belonging to a very oddball branch of the Kartvellian language family; how oddball it is, is demonstrated by the number of the vowels in Svanetian, 18 vs. 5 in Kartvellian languages; they are also distinguished by their inflatable war banner, a design identical to the Türkic dragon banners; their location in the inaccessible mountain gorges testifies that they were not welcome by their Georgian neighbors; and their tower-homes resemble those of the Irish landscape, each family is a fortress. It is fascinating that in Türkic tradition Svans are identified with Suvars, a most powerful and proud tribe that carried its identity until the 18 c. as owners of the Karajar/Chernihiv state, were a dominating layer of the Khazar and Bulgar states, and left their trace in the Anatolia and Central Siberia. At some time, the Svans controlled the valley of the Kuban/Kuman river, which is an ancestral land of the Türkic Balkars and their branch Karachais). 4. The final form of the initial ethnonym was Suvars (it will be discussed later). - Initial point: Balkan Peninsula. - Intermediate point: Asia Minor, southeastern region of the Black Sea coast, basin of the river Kuma, steppe and forest zone of Western Siberia, northeastern coast of the Black Sea, steppe regions of the Crimean peninsula, Northern Dagestan. - Final points: middle Itil basin and the territory between Donets and Dnieper. 6. Ethnic affiliation of the Savirs: an ethnos of a mixed type, influenced by various peoples during their long existence: Huns, and Ugrians, etc. At the end Savirs became a Hunnish people. 7. Relation of the Savirs to Bulgars: Savirs were not descendents of Sumers - soldiers, i.e. Bulgars, they came into the ethnosystem of the Dagestani Bulgars as Huns, not as Bulgars. 1.3. Baryndjars. The Arabic and Iranian authors called them Barandjars or Belendjars. The self-name of the people was Baryndjars. Baryndjars are the descendents of the part of the Sabanian clan Baryn that remained in Northern Dagestan after the lager part of the clan left to the west. The Baryn clan was the most numerous and powerful among others four Sabanian clans, namely: Ak-Tuba, Ak-Suba, Djulut and Bakhta. The relation of Baryndjars to Dagestani Bulgars. Baryndjars entered the ethnosystem of Dagestani Bulgars not as descendents of Sumers - soldiers, but as one of Sabanian clans. Baryndjars held an extensive valley in the middle course of the river Sulak in the Northern Dagestan. They were herdsmen, hunters and fishers. Baryndjars raised horses, sheeps, large horned cattle, and lead a semi-nomadic way of life. They were skilful potters. The utensils made by Baryndjars were famous in all of the Northern Caucasus. The most skilful artisans stamped their personal brands, tamgas, on the products. Quite frequently among the ceramic products of the Baryndjar artisans is a tamga as a circle, a symbol of the sun. Baryndjars also processed wool yarn and engaged in the home weaving. Thirty-year war (706 - 736 AD) with the Arabs had a drastic effect on the destiny of Baryndjars. In 722 - 723 the Arabs drowned 20 thousand of the captured Baryndjars in the Terek. In 736, the remaining Baryndjars left to the Lower Itil. So, in the 737, in the Lower Itil area, gathered the remnants of the three peoples from the Dagestani Bulgar ethnosystem, i.e. : Barsils, Savirs, and Baryndjars. In the Khazar Kaganate, they found a political-military refuge. At that time Bardjil was a Khazar Kagan (Khakan). Ascending the Kagan post, he accepted Judaism. When refugees arrived from the Northern Dagestan, Bardjil attempted to coerce them to also accept Judaism. Among the Dagestani Bulgars were both Muslims and Tengrians. They refused to accept Judaism, and fled to the regions of the Northern Itil basin, to the Bulyar princedom (1; 25). At that time there, in the regions of the Northern Itil basin, lived Utigs and Murdases (Mordva/Mordvins/Mordovians, Finno-Ugric people). Murdases met Burdjan refugees quite viciously, and began threatening to extradite them to the Khazar Kagan Bardjil (1; 25). The leader of Burdjans, Mar, asked for help from the ruler of Kara-Bulgar Baltavar Avar. Avar sent a younger son of Tat-Ugek with a numerous army consisting of Sabans. Sabans left to the Itil basin with wives, children, and all the property. Murdases were defeated. The survivors fled to the upper course of the river Oka (Aka-Idel). In the lands, cleansed of Murdases, also settled Tat-Ugek’s Sabans. Soon after the victory over Murdases, Tat-Ugek returned to Kara-Bulgar with a small group. Most of his troops he left in Bulyar, in a case of an attack by Khazars. Between 747 and 759 AD, on the left bank of Itil, in the territory of the modern Spassky region of Tatarstan, Burdjans build a city. It was named Marduan in honor of the commander Mar (“Created by Mar”). Mar proclaimed himself a Prince. So emerged a Marduan princedom. The princedom was small: the Marduan city and adjacent small territory. Sabans settled east of the Marduan princedom and subordinated to it (1; 26). With time, Sabans intermixed with Utigs. However, the Sabanian dialect of the Türkic language began to predominate. Their ethnonym was preserved in the name of the heavy plough for plowing clay soils. In its origin the plough was Utigian, but it became widely known as the Sabanian plough, saban (and from that came a Sabantui, a harvest celebration) (1; 26). In 759 the Khazar Kagan Bardjil incited Bashkorts to attack the princedom Marduan. Bashkorts crossed river Djaik (modern Ural) and began to advance in the direction of Marduan. The old prince Mar asked again for a help from the Kara-Bulgar Baltavar Avar. Avar again sent the son of Tat-Ugek. However, this time Tat-Ugek went on a campaign in the head of the troops consisting of Kara-Bulgars, i.e. 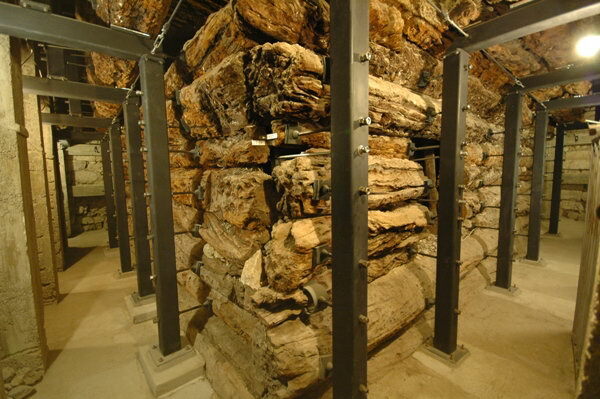 the Western Bulgars (authentic Bulgars). Tat-Ugek defeated Bashkorts. His victory was easier because the warriors of a strong Bashkortian tribe of Esegs switched to the side of Kara-Bulgars. Bulgars called Esegs Azna, Atnya or Aznak (1; 26). Esegs resolved to settle in the territory between the rivers Sak and Sok, and create a princedom (Bekdom) Esgel. They proclaimed Tat-Ugek a Prince. Tat-Ugek did not want to return to Kara-Bulgar. The problem was that soon after his departure his father died. The rule of Kara-Bulgar passed to his senior brother Tat-Utyak, but the relations between the brothers were tricky. In 760 Tat-Ugek subjugated the princedom Marduan. The city Marduan was renamed into Bulgar. The princedom, created by Tat-Ugek, was was called Bulgarian. Thus, princedom Marduan, created by Burdjans, ceased to exist in 760. In its place emerged a new state, the Bulgarian princedom. The Sabans - farmers recognized the authority of Tat-Ugek, but Sabans - herdsmen did not submit to him and moved away, to the upper course of the river Belaya (53.4°N 56°E). Because Kara Bulgars and Esegs came to the Middle Itil basin without wives and children, and without property, they “took” Sabanian wives, and they also very soon began speaking Turanian and Kypchak dialects of the Sabans, as their own languages “(1; 27). Esegs began to call the princedom of Tat-Ugek “Belermia”, as it “was in the territory of former Bulyar, and Kyrgyz Türks changed this name to ‘Besermen’, and from that time Bulgars also were sometimes called ‘Besermens’”(1; 27). In 787 Bashkorts again crossed Djaik and attacked possessions of prince Tat-Ugek. This time, the Khazar Kagan Bulan instigated them. Prince Tat-Ugek advanced towards the opponent. However, soon he received news about a death of his brother Tat-Utyak (d. 787), and left to Kara-Bulgar to take the throne of the Kara Bulgar Baltavar. During crossing of Itil in the area of the modern Zhiguli (Jiguli) mountains, Tat-Ugek drowned (d. 787): “his raft was drawn in a whirlpool under the water” (1; 27). Ethnic mix of the Bulgarian princedom. First, Utigs: the descendents of the Cimmerians and Huns, since the 1st century AD involved in agriculture. Secondly, Barsils: the descendents of the Sumers - soldiers, settled in Northern Dagestan. Thirdly, Savirs (Suvars): they arose as a result of intermixing of Ugrians with Huns. In - fourth, Baryndjars: Turkic speaking Sabanian people, since ancient times living in Northern Dagestan. In - fifth, Esegs: Bashkortian people, who previously lived east from Djaik (Yaik, Ural) river. In - sixth, Sabans: an originally Iranian-speaking Sindian clan, later Türkified as a result of intermixture with Oguzes and Kangly. In - seventh, Kara Bulgars, descendents of Sumers - soldiers, settled in Dniepr basin. In - eighth, Askels (aka Ezgils, Esegs, Azna, Atnya, Aznak): they came to the Middle Itil basin in the first half of the 9-th c. from the east. In ancient times, Askels lived in the region of the rivers Irtysh, Tobol and Tura. The name of these people meant “people from ermine area”. From the Western Siberia a part of the people moved to the lake Balkhash. From there, Askels spread to the Middle Itil basin (see Yu.Zuev The Strongest Tribe - Ezgil). Originally, each kinfolk held a definite territory. Savirs settled in the basin of the rivers Maina and Utka. In the beginning of the 10-th c. they built a city Nur-Suvar. It was near the modern village Kuznechikha of the Spassky region of Tatarstan. Bulgars took the territory between the rivers Utka and Bezdna. The city of Bulgar (former Marduan) became their ethnic center. Its ruins are on an outskirts of the modern Bulgars of the Spassky region of Tatarstan. Sabans settled east of the Bulgar city. Utigs also lived there. Askels settled on the right and left banks of Itil near the mouth of Kama river. Its group center was in Oshel (i.e. Uch-El, three lands). It was on the right bank of Itil, near the modern village Kirelskoe of the Kama-Ustinsky region of Tatarstan. Barsils settled in the basin of the river Maly Cheremshan. Bilyar became the center of the Barsil people. Baryndjars (Barandjars) settled in the region of the upper and middle course of the river Bolshoy Cheremshan. Esegs settled between the rivers Sak and Sok. In the “melting pot” solidified the base that formed a new ethnos, the Itil Bulgars. In this ethnogenetical process, Kara-Bulgars played a fusing role. Certainly, at this stage the Bulgarian assimilation was not complete and all encompassing. Existed only the preconditions for the formation of the base for the subsequent development of the Itil Bulgarian nation. This initial community, meanwhile, consisted of a hierarchy of various ethnic groups. During the forming of the ancient Bulgarian ethnosystem, its structure included ancient Iranian, ancient Türkic, and ancient Manjurian, and mixed peoples and clans. By the end of the 8-th c., the original historical “competition” between ancient Iranian, ancient Türkic, and ancient Manjurian languages ended with a victory of the Sabanian dialect of the Turkic language. The Sabanian dialect of the Turkic language was close in its origin to the Kumanian language and represented a result of the mixture of ancient Iranian, ancient Manjurian and ancient Türkic languages. The leading position of the Sabanian dialect did not mean the absence of the distinctions in the language inside the ethnosystem of the Itil Bulgars. The analysis of the materials in the ethnic history of the Western and Dagestani Bulgars shows, that basically, they had the same common history. By the end of the 780's was, mainly, completed the period of the existence of the ancient Bulgarian ethnosystem, and started a transition to the ethnosystem of Itil Bulgars. 1. Islam - one of the three, alongside with Buddhism and Christianity, global religions. It arose in the 7-th c. in the Arabian Peninsula. 2. Koran - a sacred book of Мoslems, the record of the sermons of the prophet Mukhammed. The word “Koran”, translated from Arabic, means, “read, said one”. 3. Мoslems - people professing Islam. 4 . Caliph- the highest Мoslem title. It is translated from Arabic as “Viceroy” - Viceroy of the prophet Mukhammed. The first three Viceroys of the prophet Mukhammed ruled over Baghdad, Egyptian, and Cordova Caliphates. 5. Khadis- the brief sayings of the prophet Mukhammed and his followers, or small stories about the acts of the prophet. 6. Shariat- a set of legal and religious norms and rules based on Koran, whose observance means a righteous life, resulting in the person going to paradise after death. 7. Emir- a title originally given to the highest commanders. Then Caliphs began to give it to their viceroys. 1. Bakhshi Iman. Djafgar tarikhy. Collection of Bulgarian annals. Vol. 1, Orenburg, 1993. 2. Herodotus. History in nine books. /Transl. and comment by G.A. Stratanovsky. L., 1972. 3. Dyakonov I.M. History of Midia from ancient times to the end of the 4th of century BC - M. - L., 1956. 4. History of the USSR from most ancient times to our days. Series first. Vol. 1. Primitive society. The most ancient states of Transcaucasia and Central Asia. Ancient Rus. (prior to the beginning of the 13-th c.), M., 1966. 5. History of Tatar АSSR, Kazan, 1967. 6. Fakhretdinov Riza. Ibn Fazlannyn Bolgarga kilue // Socialistic Tatarstan, 1991, September 6. 7. Lubker. Dictionary of classical ancient times, St. Petersburg, 1887. 8. Latyshev V.V. Reports of the ancient writers, Greek and Latin, about Scythia and Caucasus. Vol. 1, Greek writers, St. Petersburg, 1904. 9. Theophilactus Simocatta. Historae. М., 1957. 10. Chichurov I.S. Byzantine historical compositions: Theophan’s “Chronographia”, Nikifor’s “Breviariae”/Texts, translation, comments. M., 1980. 11. Claudius Ptolemy, Geography, Antique geography, М., 1953. 12. Gumilev L.N. Ancient Rus and Great steppe, М., 1989. 5.1. From “Djagfar tarikhy” by Bakhshi Iman. Burdjans and Sabans, who came with Tat-Ugek, settled in the vacated territory. Burdjans built for themselves a city, which they was called, in honor of the chieftain, Marduan... (page 25). Sabans settled to the east of Marduan and its small bekdom, and in the beginning submitted to him. They came with wives and children and, consequently, their language did not fade away, but prolifirated. The local Utigs intermixed with some of them and taught them the farming skills. When Kara-Bulgars came, they called the Sabanian plough a saban, even though it was Utigian in origin. In 759... the peaceful life of Marduan was broken. Bardjil, burning for retaliation, sent on Bulyar Burdjans the Bashkorts, and they crossed Djaik. Sabans took to their weapons, and old Mar sent to Avar the ambassadors with a request for help. Avar again sent Tat-Ugek to Marduan, and died soon after his departure... Tat-Ugek met with Bashkorts and defeated them, due to Esegs, the warriors of a strong Bashkortian tribe, who we call Azna, Atnya or Aznak; who switched to his side (page. 26). Esegs... proclaimed Tat-Ugek a Bek, and he established a Bekdom Esgel between rivers Sak and Sok. Esegs, like Kara-Bulgars of the Tat-Ugek, took Sabanian wives and very soon also began to speak the Turanian and Kypchak dialects of the Sabans, as their own languages... (Page 27). Source: Bakhshi Iman “Djafgar tarikhy. Vol. 1, Orenburg, 1996. Page 11-112. ... The Bulgarian territory is adjacent to the Burtases’ (Mordva/Mordvins/Mordovians, Finno-Ugric people, with m/b alternation) land. Bolgars live on the bank of the river, flowing to the Khozarian (Caspian) Sea and called Itil (Itil), which is running between Khozarian and Sakaliba (In Russian literature ‘Sakaliba’ - ‘Kipchaks’ are interpreted as ‘Slavs’, though on the east side of Itil were located Kipchaks, not the Slavs. “Sakaliba“ is a direct translation of “Kipchak“ = “Pale Saka“ -Translator’s note) lands... Their country consists of marshy lands and thick woods, among which they live... Bolgars are divided into three groups: one group is called Bersulа, another Esgel, and the third Bolgar; for all three their way of life is at the same level. ... From Burtases’ land to the land of these Bolgars is a three days journey. 8.1. When Burdjans moved in mass to the Middle Itil basin region? The mass resettlement of Burdjans in the regions of the Middle Itil basin occurred in the period between 737 and 747 AD. Burdjans was a general name for Bulgars and peoples closely related to them who lived in Northern Dagestan. 8.3. What peoples belonged to Burdjans? Barsils, Suvars, Baryndjars belonged to Burdjans. Barsils belonged to the authentic Bulgars, i.e. were the direct descendents of the Sumers - soldiers. The other peoples were closely related to Bulgars. 8.4. What the name “Dagestan” means? The territory of modern Dagestan was called Gaptag. It began to be called Dagestan in the 11-th c. Translation (from Türkic): “Mountain Country”. Dagestani Bulgars settled in the foothills and lowlands in the region of the rivers Sulak, Aktash and Yaryksu. 8.5. Who were Askels, and what affiliation they had with Bulgars? Askels (alt. : Isgil, Izgil) were Türkic speaking people. Their name was formed of three words: As - ermine, Kze - in the Siberian dialect of the Türkic language it means “man”, El (El) - people. The semantic translation is: “people from ermine area”. Originally, Askels lived on the banks of rivers Irtysh, Tobol and Tura. That area was very rich with ermines (see Yu.Zuev The Strongest Tribe - Ezgil). In ancient times Askels, like Uigurs, were one of the Gaogüy (Tele) clans. Translated from the Chinese, the word “Gao-güy” means “high carts”. They were called so because they rode carts with high wheels. Gaogüys were descendents of Huns (i.e. Huns were one of Tele tribes). With time, Askels became a numerous people, including the following clans: As (Ermine), Kuorük (Ground squirrel), Kusen (Polecat), Karga (Crow, Raven), Kuu (Swan), Ary (Bee). In the opinion of the eminent Türkologist N.A. Aristov, Askel’s language was Türkic, but “with a stamp of deep ancient times’. In the first half of the 8-th c. Askels were attacked and displaced by the (Ashina?) Türks. Askels were compelled to move to the Balkhash area. From there, in time, a part of them left to the Lower Itil area, and another part left to the banks of Kama. In the first half of the 9-th c. they settled in Lower Kama area. Source: Aristov N. A. Notes about ethnic makeup of Turkic peoples and nations // Antiques alive, Issue 3-4, 1896. It was a Bashkortian group Esegs. Bulgars called them Azna (Atna, Aznak). 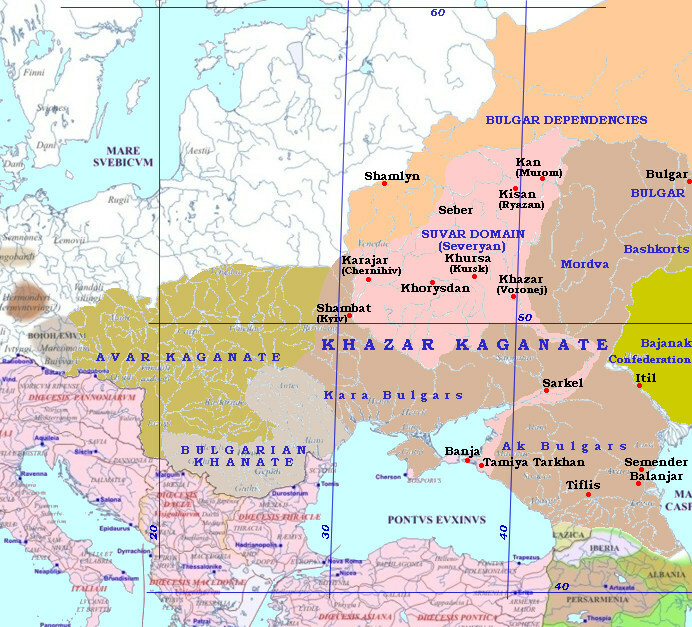 The warriors of this people switched to the side of Bulgars and settled between the rivers Sak (later it was re-was called Kondurchak) and Sok. Esegs - warriors married Sabanians, and Bulgarized with time. They should not be confused with Askels. 8.7. Where is the Derbend pass? Between the Main Caucasian Ridge and the Caspian Sea there is a “corridor”, 130 km long, its width does not exceed 15 km. In deep ancient times the Caucasian mountains were called Kap-Kash. Then they began to be called Kath-Tau (All three names are synonymous: Kau-Kas, Kap-Kash, Kas-Tau in Türkic means either “White Cliff“ or “White Mountain“. This is one of the evidences testifying that before the Herodotus time, Türkic not only was in the Caucasus, it was a major and lingua franca language that penetrated foreign lands). 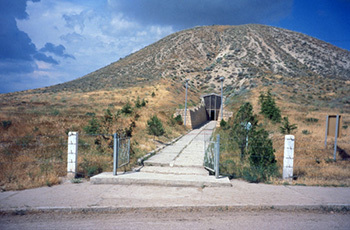 In the pass chokepoint (4 - 6 km) between Caucasus and Caspian is a hill that protrudes toward the sea. On that hill in deep ancient times people built a city Chora. Sometime before our era, Persians built a wall and a gate (“Тимер Kapyg”) from the city to the mountains. In the 4-th century AD at the bottom of the hill was built a city Derbend (aka Derbent). With time the corridor between the Caucasian mountains and the Caspian sea began to be called a Derbend pass. Source: Semenov I. History of the countries and peoples of the Western Caspian(1 millennium of new era), Kazan, 1994. 7. Fr. 25 …Mt. Bermium, also, is somewhere in this region; in earlier times it was occupied by Briges, a tribe of Thracians; some of these crossed over into Asia and their name was changed to Phryges. 10.3.16 … as the Phrygians themselves were colonists from Thrace, so also their sacred rites were borrowed from there.